Mizuho Financial Group Inc. and Toho Bank were set to begin testing a QR code-based smartphone payment system in Fukushima Prefecture in April. The move is in anticipation of moves toward a cashless society. The tests also come ahead of J-Coin － a new digital currency that Mizuho Financial Group plans to launch. In the tests, a new payment system will be introduced at some shops at Tokyo Electric Power Company Holdings, Inc.'s Fukushima No. 1 nuclear power plant on a trial basis. The company aims to pinpoint and examine any problems that are likely to emerge with the payment system. The tests will start this month. Afterward, the company aims to expand use of the system in Tomioka and the entire Hama-dori area. The system features a dedicated smartphone app. Users can charge the app with electronic money by transferring funds from their accounts with Toho Bank or Mizuho Bank, an affiliate of Mizuho Financial Group. Once charged, people can use their smartphones to make payments by reading QR codes at shops. The system is likely to be convenient and more efficient, as users can transfer money electronically. The system is also expected to help shops cut costs by lessening the burdens involved with handling cash, the banks said. The tests are set to take place at a cafeteria and a convenience store at the nuclear power plant, where more than 6,000 people work. The system will initially be for people who have an account at Mizuho Bank, but will be expanded to include Toho Bank account holders in June or July. The test will continue until the end of this year or the beginning of next year. QR code payment systems have become popular in China and other countries, but Japan's financial industry has just started standardizing its system. Mizuho Financial Group and other financial institutions hope to accelerate standardization of the system through conducting tests. "This project can have great appeal internationally, with the system starting in Fukushima Prefecture. 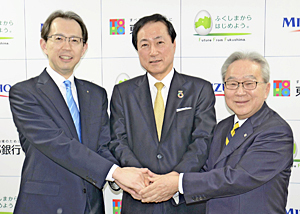 We hope it will be put into practical use before the 2020 Tokyo Olympics," then Mizuho Financial Group President Yasuhiro Sato, now chairman, said at a press conference held at the Fukushima prefectural government office. Toho Bank President Seishi Kitamura said, "[This project] is expected to boost the reconstruction and growth of disaster-hit areas."